When it’s time to switch off, whether you enjoy a bustling lively night-life or seek the escape of a deserted windswept beach, Derry City region has both the natural landscape and the wealth of culture on offer, to enchant and entertain once the working day is done. Located where the wild Atlantic way meets the giant causeway, our coastline takes in stunning peninsulas, secret nooks and coves, and endless golden beaches. Adventurous spirits will be inspired by scenic mountain ranges,rivers,lakes and miles of unspoilt countryside. Space also means real estate and the region offers a wide range of flexible and effective options, from state of the art labs and start-up incubators, through to Science parks and Grade A accommodation, to large scale sites for manufacturing supported by agencies and local authorities. The lower cost of living in the Derry city region, compared with the rest of the UK, means that salaries and hourly rates of pay can realistically remain competitive, without adversely affecting levels of personal disposable income. 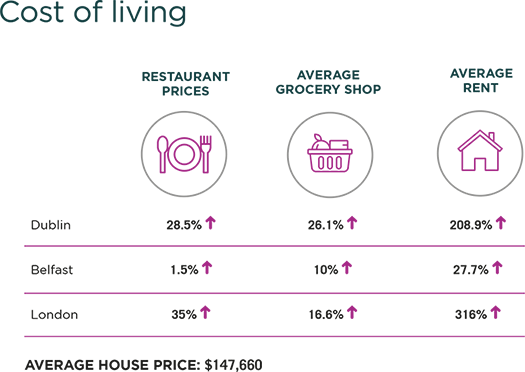 The bellow table clearly show the divide in terms of property prices, and daily essentials.